In a society that values thinness, conditions like anorexia and bulimia cut across race, color, gender and socioeconomic constraints. They’re defined by extreme emotions, attitudes and behaviors surrounding weight and food issues. According to the National Eating Disorders Association, roughly 30 million Americans will suffer from an eating disorder at some point in their life. Two new dangerous eating disorders they are mostly being seen with millennials are “pregorexia” and “drunkorexia.” We turned to Dr. Sanam Hafeez, New York City based neuropsychologist and Teaching Faculty Member at the prestigious Columbia University Teacher’s College for some insight. While binge-drinking is in no way gender-specific, drunkorexia is a practice more common to females. This term is used to describe the unhealthy combination of extreme food restriction, bulimia and alcoholism; basically, it is a term for a female who starves herself throughout the day, then drinks to excess at night. Those who engage in this practice rarely suffer from anorexia. This is because a female with anorexia tends to avoid alcohol consumption altogether. Even if she eats nothing during the day, the high caloric content of alcohol is too frightening. “The fear of losing control is enormous. Rigid control is essential to maintaining anorexia. Alcohol may lead to a relaxation of this rigidity and she may fall victim to the allure of food which is why anorexics avoid alcohol,” explains Dr. Hafeez. 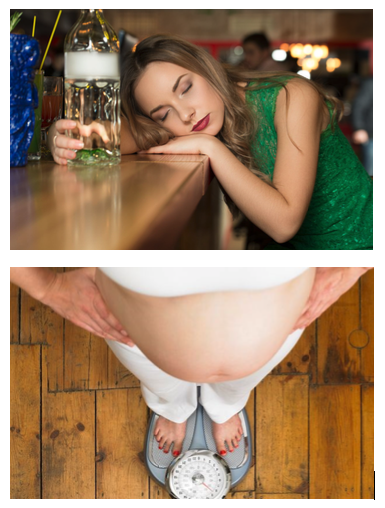 For myriad reasons, a female with bulimia is much more likely to fall into the category of drunkorexia. “In the case of the bulimic, alcohol may play a significant role in their binge-purge cycle. In addition to eating huge quantities of food, she drinks excessively. Not only does she experience the mood-altering effects of alcohol, but also the large amount of fluid helps her in the purge process. After purging, she may drink more to sustain the high of intoxication. It’s an incredibly damaging cycle,” adds Dr. Hafeez. Eating on an empty stomach will definitely increase blood alcohol concentration, simply because there is nothing there to absorb the alcohol. This increase is more likely to result in blackouts, injury, and poor decision-making. It also can result in temporary dehydration because of excessive urination and lack of thirst. Also, engaging in this behavior frequently can lead to nutritional deficiencies. These are some of the more immediate effects, but longer-term effects can include increased damage to the liver and kidneys, as well as alcohol addiction. If you are worried that you or someone you know are suffering from drunkorexia or you know someone that is, it is important that you seek professional treatment. “We would want to work on the needs to control and escape also worthiness issues hence, the focus on thinness,” Hafeez explains. In the age of social media, it’s not so surprising that this condition exists. Pregnant millennials see celebrities their age pregnant on Instagram with their “bounce back body” in tip-top shape just weeks (or a few posts) after giving birth. These women are so afraid of weight gain during pregnancy that they don’t adequately nourish themselves and their developing baby. “While it is not an actual diagnosis, the fear of weight-gain due to pregnancy and worse, the inability to return to the pre-baby weight, makes some expectant mother’s pregorexic and this is when some turn to strict dieting and excessive exercise,” shares Dr. Hafeez. Not gaining enough weight when you’re pregnant is dangerous. It can increase the risk of miscarriage and birth complications such as prematurity and low birth weight. The risk of pregorexia might be higher for women who have a history of eating disorders and those who have a weak social support system. What happens when you don’t eat enough nutritious food in pregnancy? When you severely restrict your food intake, or binge and purge while you’re pregnant, your baby will not receive the necessary nutrients it needs to develop in the womb. Your baby may be born underweight and develop other health complications during infancy. You will also likely be fatigued. The lack of nutrients to your baby may hamper their growth and development which may later result in serious health conditions. Women should not be shamed for this condition; it doesn’t make them bad mothers, they are fighting a battle. Instead we should talk about it more, so the disorder can be better understood and destigmatized. Hotline available 24 hours a day, 7 days a week. National Eating Disorders Association Helpline: 1-800-931-2237, This helpline offers support Monday–Thursday from 9 a.m.–9 p.m. EST, and Friday from 9 a.m.–5 p.m. EST. Something Fishy: 1-866-418-1207, This eating disorder helpline offers treatment referrals nationwide.